Finance details - you will need these to get paid. Bank account details - BSB/Account number/Branch name. Tax File Number - if you do not have a TFN, you need to apply for one before enlisting in the Navy. All the items in the 'What to bring' table, below. All the documentation as listed in the 'Document checklist', below. All the requirements as listed in 'Other important information', below. Electrical extension leads, power boards, double adaptors. You will be issued with a Navy tracksuit which you will wear until you receive the rest of your uniform during your training. The following is a suggested list of articles of clothing, toiletries and other items you must bring with you. Suitcase or bag Suitcase/soft-sided bag. MUST BE LOCKABLE to store civilian clothing. The RAN takes no responsibility for lost items. Nightwear Two-piece pyjamas/nightie/boxers & t-shirt. Conservative styles. Rubber thongs Shower footwear – Crocs/non-slip styles are suitable. Underwear A minimum of four pairs, must be white or flesh-coloured cotton. Sports brassiere A minimum of four - white or flesh coloured (females only). Running shoes Appropriate sporting shoes. Skate/street/casual shoes will not suffice for PT activities. Shoe brush* For polishing shoes and boots. Hair care Hair combs/bobby pins/hair nets of your natural hair colour (females only - as required). Toiletries As required. Allow for one month of usage. Washing powder* 1kg of washing powder is recommended. Steam iron* A good quality iron will serve you well. Shoe polish* One tin of Parade Gloss boot polish is recommended. * Denotes items that can be purchased at the Recruit School canteen during the first week, however, prior purchase is highly recommended. The Navy no longer sells cigarettes, therefore it is advised to organise enough to see you through the first five weeks of training. FULL BIRTH CERTIFICATES: Extracts will not be accepted or deed poll certificate if name changed. Birth Certificates in any language other than English require a full official translation. ALL PASSPORTS: All passports ever issued or held, whether current or cancelled, whether issued in Australia or any other country. Details of all passports issued but not in your possession should also be provided. EVIDENCE OF EMPLOYMENT: Last 10 years (pay slips, group certificate or reference with official letterhead). EDUCATIONAL CERTIFICATES AND/OR TRANSCRIPTS: Final year certificate or most recent academic qualification will suffice. MARRIAGE CERTIFICATE(S): For all marriages if applicable. Recruits in a de facto relationship are to fill in the relevant documentation which is available from your Recruiting Centre. Once completed this information is to be passed to your Instructor when you have been allocated to a class on your arrival at RS. DIVORCE DOCUMENTS FOR ALL DIVORCES: Decree Nisi or Decree Absolute. CHANGE OF NAME CERTIFICATE: If applicable. CERTIFICATE OF SERVICE OR DISCHARGE: Pertaining to service in the Defence Force of any country. NATURALISATION CERTIFICATE: For all nationalities held. PROOF OF RECEIPT OF UNEMPLOYMENT BENEFITS. LETTERS OF REFERENCE: Provide copies of any written references provided by previous employers, personal referees, school teachers and coaches. 4 x CURRENT PASSPORT STYLE PHOTOGRAPHS: Standard size passport photos - uncut, not endorsed and taken within three (3) months of your enlistment date. Males are to be clean shaven and have a short hairstyle. Females are to have their hair tied back and both sexes are to have their hair as close to their natural colour as possible when the photos are taken. Passport application forms and high level security clearance forms will be completed at RS. TAX FILE NUMBER (TFN). You are required to bring your TFN with you for payment purposes. If you do not have a TFN, now is the time to apply. Current address and dates of residence. Nationality and date of arrival in Australia (if applicable). Step Parents: As per natural parents above. Last ten (10) years of addresses including dates of residence (month and year). Naturalisation: Date and place of naturalisation of subject and partner if applicable. Employment/Study: Details of last ten (10) years of employment (school, university, unemployment, or travelling) including employers’ name, address, type of work done and dates of employment (eg. Oct/99-Apr/00, John’s Mega Store, Sales person, 7 Old Trafford Street, Chester, Vic). Complete the work sheet providing two referee and one previous contact details including phone number. Addresses: Details of last ten (10) years addresses including dates of residence. Clubs/Associations: Details of any clubs or associations Recruit has ever been a member of, including Name of club, office held, dates of membership and reason for leaving if applicable. Overseas Travel: Details of travel are to reflect passport, including stopovers. (Passports are not always a complete reflection of all travel undertaken). Parent’s passport to be provided if subject’s travel documented on same. You will also be required to provide details of any family members residing overseas, including address and month/year that members commenced living overseas. Pay and banking details: Bank account number, branch name and BSB number (check these details with your bank before you leave). This is absolutely vital. You will be paid by an electronic transfer of funds to your nominated bank account. Therefore you will need to have your bank account details and your TFN information on your person when you arrive at RS. Full birth certificates for all dependants: Extracts will not be accepted or deed poll certificate if name changed. This includes all children under your care. Birth Certificates in any language other than English require a full official translation. To avoid possible complications from repeating the full dose of some vaccines, please bring with you to RS, vaccination certificates or verifiable proof, such as a doctors certificate, indicating the type of vaccines that you have received and the date that you were vaccinated. Interdependent relationships: Recruits in an interdependent relationship (i.e. de facto) who wish to have the relationship recognised by the Navy are to complete the relevant documentation available from your Recruiting Office. Your DFR Centre will have already asked to see some of the documentation listed. 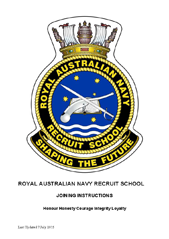 YOU MUST STILL BRING it to Recruit School, as the Navy and the Defence Security Agency has specific requirements for the documents, separate to those of the DFR Centre. Security clearances and passports: The Navy requires you to gain a security clearance and hold an Australian Government passport (green cover). All Recruits are to read the Document Check List and Personal Information Requirements to ensure the appropriate documentation is brought to RS. The application process is very thorough and often a long procedure. To ensure a speedy processing of your application, it is very important that you bring all the evidence required. Recruits in an interdependent relationship are to fill in the relevant documentation which is available from your Recruiting Centre. Once completed, this information is to be passed to your instructor when you have been allocated to a class on your arrival at RS.